Now I offer my own humble opinion and hope that I can drill down a little deeper for the “Next-Level” fan who reads at this site. Whenever people throw stats at me — it’s hard to keep from nodding off, but bear with me a touch as I condense my assertions to a few pertinent points. When you compare last year (2014) to Chip’s final year as a coach, it is evident that Oregon is a more balanced offense under head coach Mark Helfrich. Oregon is not going to an all-passing attack such as the Air Raid offenses of Cal and Washington State, but it’s clear that the Ducks have been shifting to the passing side gradually. Oregon’s average rushing yardage per game still led the Pac-12 last year, but dropped by 81 yards (315 to 234) from 2012 (Chip’s final year). Conversely, the Ducks have watched their passing yardage increase by 90 yards per game (312 vs. 222) in the same time period, for a slight overall yardage increase of nine yards a game to 546 yards versus 537. When a QB can throw like this….shouldn’t you? 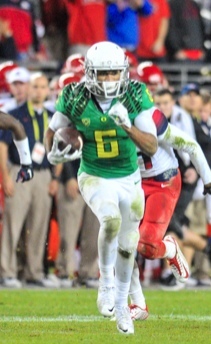 Is this due to adjusting to the personnel as Oregon had Marcus Mariota and the best group of WRs ever at Oregon? Or was this a conscious adjustment to a balanced offense to build upon for the future? It would seem from the recruiting that the nation’s best wideouts are coming to the Ducks, so I have to assume they are “promised” an equal number of touches (as a position group) as the running backs. As the kids would say, “whatever.” The bottom line for us fuddy-duddies is that we love seeing a balanced offense so that defense never knows what is coming at them, and if we are to capitalize on the QB transfer coming in? Helfrich should continue this trend. Many of you recall when I introduced Oregon’s “Hidden Bear” defense on this website about a year-and-a-half ago and how it contained the Texas offense in the Alamo Bowl. One of the most painful analyses I ever had to create was explaining how Ohio State gouged the Ducks with their Counter Play in last year’s National Championship game. We as fans needed to know how they analyzed our tendencies and took advantage of them. An adage about football coaches? They throw something at you until you prove that you can stop it, hence Oregon will see the Counter Play every game until they can recognize it and defeat the blocks or run some variations to the 4-0-4 defense to keep an opposing offense from running the Counter Play continuously. “You can call him RAY, and you can call him JAY”… but let him be BOTH! Everyone knows this guy is insanely talented, and I was completely sold on Nelson moving to defense — until the spring game. This guy has football speed that few do, and his ability to cut or stop-on-a-dime is unique; shouldn’t he be on offense as he is such an impact player? But he appeared to be a natural at corner? You cannot play him entirely both ways for the season as he would wear down, but what about using him both ways only when he can make the most impact? How about bringing him in on both offense and defense when it is 2nd-and-long, or 3rd-and-long? I would bet that there would be enough overall plays to please him, and he would still have a comparable number of picks on defense and touchdowns on offense as other skill players. That is an unorthodox strategy, but Charles Nelson is not the typical player, so shouldn’t the Ducks consider using him in the highest/best use on the football field? I would be curious as to what the “coaches” in our readership think. Is FishDuck off his rocker, or does the idea have traction? 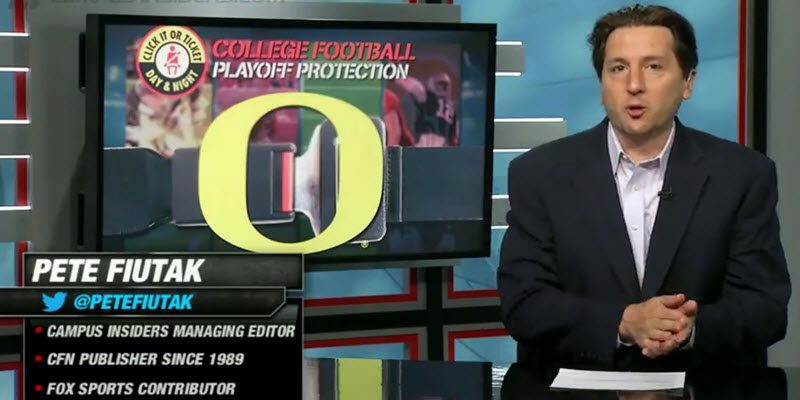 Finally — how do FishDuck’s three components for bringing the Ducks back to the College Football Playoff compare to the national punditry? Isn’t this great fun to ponder?